I had missed the last bus home. I was stranded in an unknown city. The wind and rain were howling up a storm outside the empty bus station and the only light was the flickering orange bulb of a dim fluorescent spluttering above my head. The next coach wasn't coming until after dawn. And dawn was a long way off. Needing something to help pass the time, I reached into my backpack, my fingers finding the pages of some paperback or other I had picked up a day earlier in an ugly little service-station nestled halfway between where I was coming from and the place that I needed to be. 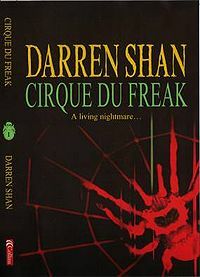 Cirque Du Freak was the title; the words splashed out in bright, almost radioactive red ink across the glossy front cover. I didn't know why I had chosen this slim sliver of a novel over the other spooky stories lining the convenience-store shelves. Maybe it was the illustration on the front cover; a leering, scarred vampire beckoning out and inviting me- daring me- to read on. Maybe it was the tagline "A Living Nightmare," that looked as though it had been scrawled beneath the picture with a scratch of dirty fingernails or maybe it was even the Goosebumps-esque three-dimensional front cover that felt as lumpy as cold rice-pudding as I plucked the book out of its pouch and thumbed the first few pages. But then, maybe it wasn't any of these things. Maybe like Darren Shan, the little boy at the heart of this story [aswell as its narrator] who, through a series of unfortunate accidents finds himself an unwilling vampire's apprentice, I was simply the victim of fate. You see, Darren Shan was just an ordinary schoolboy until he and his best friend Steve Leonard got tickets to the Cirque Du Freak; a bizarre travelling sideshow featuring such ghoulish oddities as Hans Hands, the Wolf Man and Rhamus Twobellies. But when Steve realises that one of the acts is a real life vampire and resolves to blackmail the bloodsucker into making him undead in exchange for his silence, the evening takes a turn for the terrifying as the trickster vampire plots his revenge. This book really is quite remarkable and the veins of Shan's storytelling are so juicy that you can't help but want to bite into them. In particular, the scene of Darren lying dead [well, kind of] in his open top coffin while his father sits by his side, talking all through the night about how much he loved him, was utterly life-affirming and actually made me want to phone my Dad up and let him know I was thinking about him. It was just unfortunate the bus shelter didnt have a pay-phone. But just as much as this book will make you glad to be alive, it will also scare you half to death. For all is not well in Darren's new nocturnal kingdom. His onetime friend Steve, furious at the vampire's rejection of him due to his "bad blood... evil blood" according to a revolted Mr Crepsley, vows to turn vampire hunter and to train himself in the art of "dusting" until he is ready to drive an ash stake through his onetime blood brother's heart. Clearly, dying is just the first of many problems for Darren Shan. And so I read. The wind howled and the rain hammered down and the bulb above my head flickered on and off like a strobe light in a cheap disco. But I read, with each passing page the world outside hushing down a little and the world of Darren Shan getting that little bit louder. Soon, it was all I could hear.